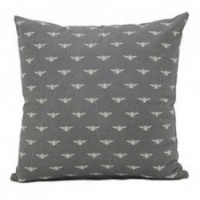 >100% cotton cushion with a cute cream bee repeat pattern on a grey background. Simple and classic, this cushions looks lovely alone or when styled with neutral velvets and other simple cushions. This cushion look great on a sofa or styled outside on your outdoor furniture with some throws for the evening if it gets a little cooler.